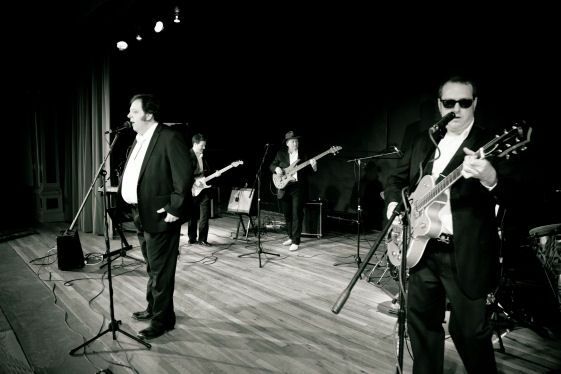 The Folsom Prison Gang is a five piece Johnny Cash tribute band located in Western North Carolina. The band was formed in 2007 and primarily performs live shows at festivals, fairs, theater and other specialty type venues around the South East and East Coast. While the Folsom Prison Gang doesn’t promote themselves as an impersonation act, they are heavily influenced by the styles present during the early years of Johnny Cash generally keep the song arrangements somewhat true to the originals (they do spice it up a bit). The band is available for Nationwide bookings. In 2011 the band released their first album titled “Cash Only” that is a collection of 10 of their favorite Johnny Cash songs that they covered in their own style. The Folsom Prison Gang is the nations leading Johnny Cash tribtue band. Book them for your next festival, fair, corporate or theater event for a performance that will have your crowd engaged, dancing and having a great time while the band performs almost non-stop music. Eric is the voice of The Folsom Prison Gang. His countless years of experience make him the perfect front man for "keepin' that train rollin'..." and working the crowds. Charlie is an extremely talented musician that brings guitar, keyboards and background vocals to The Folsom Prison Gang. Charlie performs in a number of bands as well as leading the Praise & Worship services at his Church. Ryan is the founder of the band, acting band manager, guitar player and provides background vocals. Ryan and the rest of the band work together to create that boom-chucka-boom sound that is synonymous with Johnny Cash, made famous over hundreds of recordings. It's unmistakably recognizable and enjoyed by fans everywhere. Erik provides the train beat that keeps things rolling along. Originally from Los Angeles, Erik has shared the stage with such names as Chuck Magione, Dizzy Gillespie, Stan Kenton, Jimmy Smith and many others. Erik stays busy with regional acts in the Carolinas, teaches and is a session player for Foothills Studios in Greenhill, NC. Providing the foundation for the band, Roger brings in those deep bass notes that make the songs complete. Roger also has a wonderful singing voice and provides back up volcals on a number of songs. He's had a lot of experience with many bands over the years but loves coming back to that old Rock rhythm.